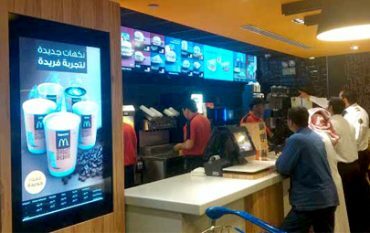 Digital menu boards help quick service restaurants increase sales and cross-sales, entertain customers and improve with digital menus. Navori QL digital menu board software empowers restaurant owners and operators so they can manage, edit and display menus instantly. QL content manager is very easy to learn. The software includes a powerful web-based CMS and content designer that anyone can use. Create rich content and publish your digital menus in minutes! Most restaurants change their menu selection based on the time of day, or day of the week. Digital menu boards let you switch from lunch menus to dinner selections automatically. Schedule the event once and let QL handle the rest. 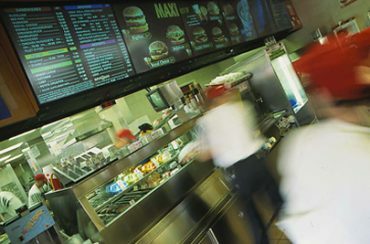 Most restaurant chains use POS systems to automate pricing and centralize product information. QL easily synchronizes with POS and back-end databases to retrieve real-time product data so your menus are always accurate and up-to-date. QL can trigger content based on any criteria you select. For example, QL will automatically remove sold-out items from your menus without any operator involvement. Items can be triggered based on environmental factors (such as the temperature), physical interaction (someone pushing a button), or from a database (POS system). QL’s Content Manager is so easy to use, anyone can update menus instantly using the Template Designer. Access is controlled, so only authorized users can modify content or change any information published to your screens. For instance, a restaurant operator may have full administrative rights to the QL system, while a manager is only authorized to publish emergency messages, or other instant notifications. You decide who has access, and what they can do. Your typical multi-location QSR chain will deploy screens and players that communicate with a central QL Server. In this example, some content will be common to the entire chain while other content will be unique to specific locations. QL lets users mix global and local content easily, ensuring the right content is always shown at the right location. Navori’s QL digital signage software is available as a Cloud based solution (SaaS) or an on premise solution, installed on your servers. QL can easily power thousands of menu boards across any distance. Digital menu boards powered by QL Player are highly reliable, and suitable for 24×7 operation. Very large deployments can even install QL Server in clusters, ensuring 100% uptime. WHY USING NAVORI QL FOR YOUR DIGITAL MENU BOARD? Menus boards today require calorie information, take-out information and processes need to change frequently. As opposed to having static menus, a lot of restaurants are turning to digital menus. I would like to explain. Over here we have a menu board. What you’re seeing is not just a static image spanning across three screens. What you’re seeing is actually a fully dynamic menu. It’s powered by a single PC media player with multiple video outputs, one per screen, and a single QL Player licence. Let’s take an example now. Let’s say I’m a restaurant manager and I just ran out of Asian Fried Beef. I immediately need to replace that and make sure my customers are aware of the change. So I go to my station and I log into a simplified interface. I change the name of the item. The price. I upload a new item to replace the Asian Fried Beef. I now want to type a message to inform my customers of the change. I press OK. The digital menu board has changed and I have my up to date content. Change menu, items and pricing effortlessly. Promote and impulse high margin products. Automated menu display based on time and date. Preserve brand consistency over a chain of restaurants.